I seemed to me that I should close up the week with a winter dress from 1864. A dress that speaks to snow and city streets. In my head, I picture Peony wrapping up in this velvet coat trimmed in soft white fur and heading out to shop for the holidays. I had looked for a plate from 1865 (that’s when the Civil War ended), but I fell in love with this winter dress from 1864. A year early, but I hope people don’t mind. Technically, the war ended in May 1865, so I guess I’m still safely in my Civil War era theme. And to go with the coat, I had to create a muff. I love muffs, but don’t think they would be practical today since I need my fingers for driving and things. I simplified the coat a bit, because I couldn’t seem to figure-out what was going on with the sleeves in the fashion plate. I thought they were maybe bracelet length, but then maybe not, based on her raised arm… Anyway, in the end, you can’t really see the sleeves thanks to the width of the skirt. One advantage of those wide skirts from Civil War era children’s clothing. This particular coat comes from a fashion plate from Le Follet. 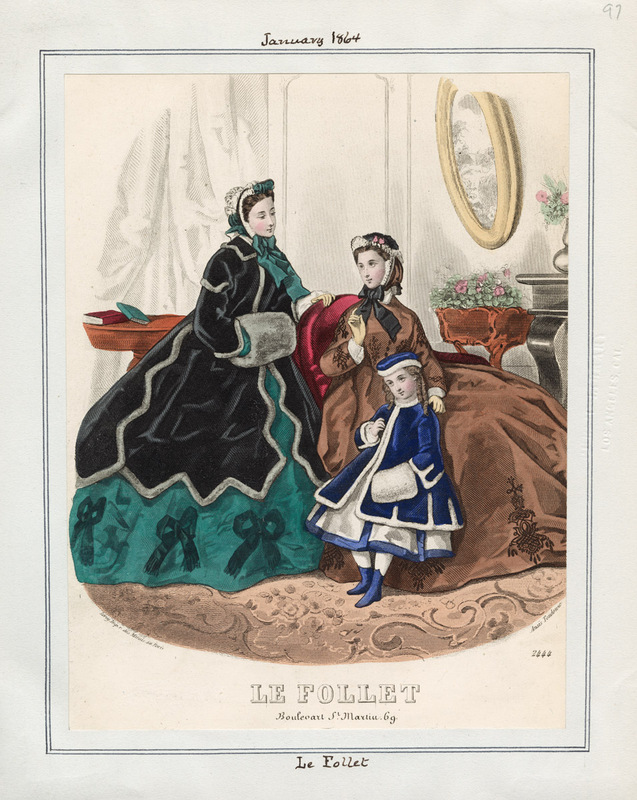 Le Follet is yet another French fashion publication. It came out weekly from 1829 to 1871, making it useful for tracing 19th century French fashions. Like all fashion magazines, it is important to remember that the plates show an idealized and fantasy version of contemporary fashion. Women didn’t actually dress in these outfits anymore than women today dress like what we see in Vogue. However, these images offer a window into what women aspired to look like. In short, the these images are a fantasy of the idealized world of glorious dresses and domestic life. 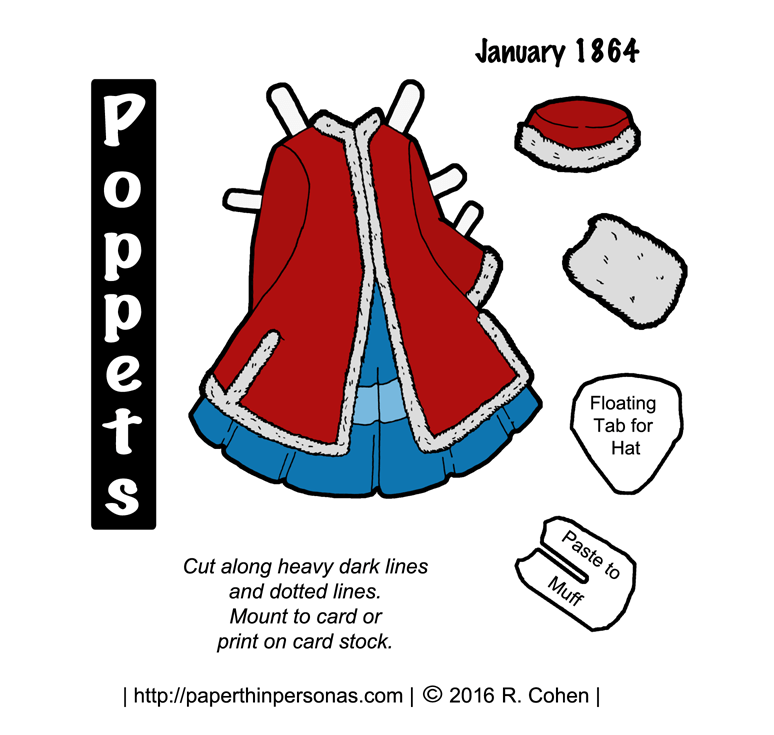 So, this ends our little foray into 1860s or Civil War era children’s clothing for the Poppet Paper Doll series. I’m a little sad to see it wrap as I have had a lot fun showing the fashion plates and talking about the era. If you missed a post, they are all linked below. I’ve had some questions about printing, so I want to mention this: When you print, you must make sure “fit to page” is NOT selected. That should give you the same size prints as before. I also do not recommend printing from the PNGs, because you can not control how your printer treats the file. This lack of control makes sizing a problem. Importnat announcement: I’ve split up my personal and blog related twitter feeds. The new twitter feed for the blog is here. So, that will be home for the blog updates from now on. Yep. As long as you print them from the PDF all without “Fit to Page” checked than everything should be interchangeable.